The AVR® 8-bit microcontroller provides various sleep modes and software controlled clock gating in order to tailor power consumption to the application's requirements. Sleep modes enable the microcontroller to shut down unused modules to save power. When the device enters sleep mode, program execution is stopped and interrupts or reset is used to wake the device again. The individual clock to unused peripherals can be stopped during normal operation or in sleep, enabling a much more fine-tuned power management than sleep modes alone. To reach the lowest possible power figures there are a couple of points to pay attention to. It is not only the sleep mode that defines the power consumption but also the state of the I/O pins, quantity of enabled peripheral modules and so on. Power consumption is proportional to operating voltage, and to conserve power you should consider using as low system voltage as all possible. Additionally, consumption is also directly proportional to clock frequency, and if sleep modes are not utilized, the device should be running as low frequency as possible. 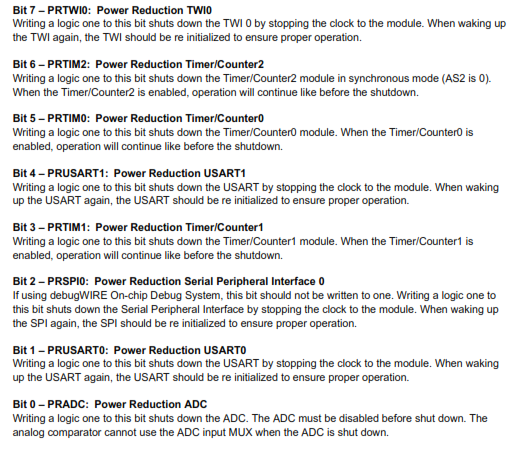 Use the Power Reduction Register (PRR0) to stop the clock to unused individual peripherals reducing power consumption. 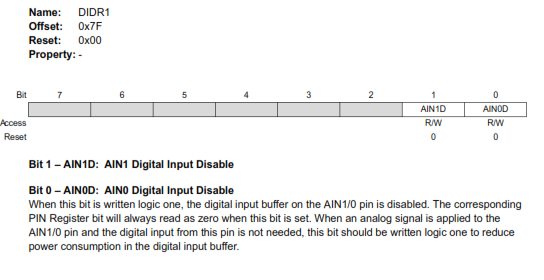 Use the Digital Input Disable Register (DIDR) to shut off unused digital input bufferrs and stop leakage current. Visit the Low Power Example page to see sample code of how to lower AVR power consumption.